Multi test winner and our most sold digital interconnect. 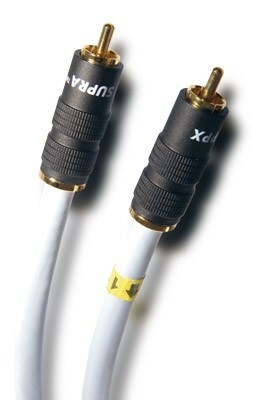 Trico-RCA is a semi-balanced interconnect with Supra PPX plugs. S/PDIF - the most common consumer electronic format 75 Ohm S/PDIF is an interface for BNC- or RCA- connectors. The most common in Hi-Fi applications. - Application example: DVD to AV amlifier. The 75 Ohm digital interconnects are designed for RCA (Phono connectors) interfaced transmission between CD transport and digital to analogue converter. They have the capability to transfer the full digital spectrum and can be used with a number of 75 Ohm applications. 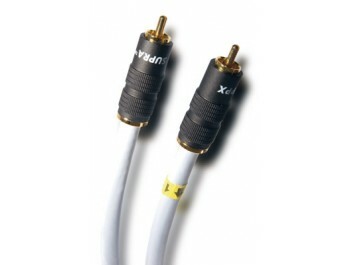 Trico is a 75 Ohm double screened coaxial interconnect cable for digital/ video signals. An interconnect of extremely low capacitance. Supra Trico is insulated with PE foam which makes only 58 pF/m and makes the propagation velocity to 78% of light speed. Trico is double shielded with a braided inner screen of silver plated OFC copper and an outer of bare OFC copper. The screens provide efficient protection from hum and noise caused by electro–magnetical fields. The centre wires are made of silver plated OFC copper. The silver plating of the conductor/screen will also enhance the high frequency properties of the cable. Semi–balanced connection configuration makes the Trico cable immune to electro–magnetic interference, i.e. makes it noise free. It means that the outer screen is connected to earth at only one end of the cable, so there is no signal through that The earth connection is at the end where the marking text starts. Connect the earthed end to the signal source. fråga om "Supra Trico 1xRCA till 1xRCA" är framgångsrikt Submitted.